Save $300 per couple off this sailing in certain cabin categories when you book and pay in full. Click here for eligible departures. Embark on an exclusive tour to the Western Antique Aeroplane and Automobile Museum, also known as the WAAAM. Feel free to explore at the facility at your leisure, offering an extensive collection of over 130 antique cars and hangers full of meticulously restored aeroplanes dating as far back as 1917. Then, available exclusively to American Empress guests, enjoy an included tour of the restoration work shop where these antique modes of transportation are brought back to life. The pilots take these tributes to America’s history to the air as often as they can and proudly maintain them in full working order. Discover their collection of Model Ts, Studebakers, the 1914 Detroit Electric, Harley Davidsons, and military vehicles before we enjoy a delicious catered buffet-styled lunch! Our next stop, will bring us to Full Sail Brewing Company, a unique, employee-owned company focused on their award-winning hand-crafted beers, as well as their impact on the environment. Enjoy a guided tour of their production facility, Hood River Brewhouse, and discover this local business’ incredible history, beginning in 1987 when they purchased Diamond Fruit Cannery and converted it into a brewery and tracing through the years until the present. Samples of Full Sail’s crisp brews, made from hops and barley grown in local trusted farms, and water from a fresh spring on Mt. Hood will surely set them apart from other breweries! Before continuing back to the American Empress, a final stop to Hood River Downtown District will be the perfect chance to explore the town’s local businesses and to pick out the perfect souvenir of this stunning and unique region! 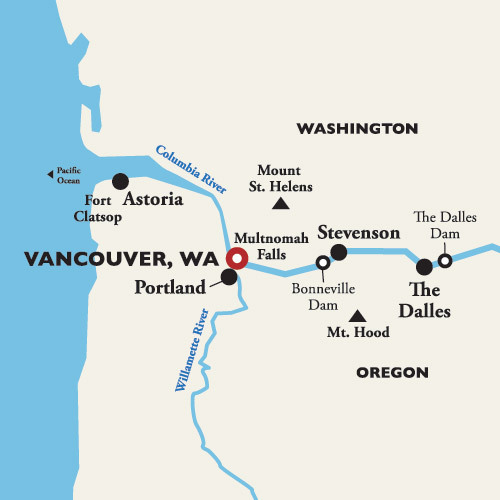 Explore Portland, Oregon – Sister city to Vancouver, Washington. Embark on a narrated journey through this iconic Pacific Northwest Town dubbed “The Rose City.” Enjoy the scenic views of this beautiful town, lined with expansive decorative murals and flowers. Guests are welcomed by a view of the historic Willamette River which flows through the downtown area before crossing over one of ten bridges and into Old Town. Today, Portland is known as a bustling commerce center, a Pacific Northwest travel destination and for its innovative culinary scene, but, in its early days, Portland was a center for the fur trade industry and held great military significance. Set peacefully against the backdrop of today’s modern city, Fort Vancouver is nestled on the banks of the river and flanked by towering pointed log fencing. Explore this meticulously reconstructed historical fort including historic buildings and an extensive fur trade outbuilding. Discover Vancouver’s link with the Hudson’s Bay Company and how it aided in the growth and success of Vancouver, Washington and Portland, Oregon. From the rugged, primitive landscape of Fort Vancouver, continue through Portland for a more refined view of the city. At the International Rose Test Gardens, guests can stroll the meticulously pruned roses in more varieties than one can imagine. Here, in the warmer months, over ten thousand blooms create a colorful frame for a panoramic view of Portland. We will continue to Downtown Portland where guests will be able to immerse themselves in the serenity of the tranquil Chinese Botanical Garden. This peaceful garden is a treasured site to many Portland visitors. Feel a sense of inspiration as you explore the 2,000-year-old art traditions, architecture, designs, and nature all in absolute harmony. The last leg of the tour passes through Portland State University and the riverfront where you can view life on the busy waterway and take a picturesque drive down Naito Avenue! AUTUMN IN THE PACIFIC NORTHWEST - This voyage through the Pacific Northwest shows you the bounty and beauty of nature, as well as the history and heritage of the people who inhabited this diverse region. And there's no better time than autumn to drift through this stunning array of sights, sounds and wildlife. The panoramic colors of fall and the crisp air will embrace you, stirring a deep appreciation for the peaceful, relaxing time before the holidays. At each port, you can embrace the culture and history of this region on an included shore excursion, such as a tour of the impressive Bonneville Dam, and the magnificent Astoria Column, with views for miles.